I’m wondering about posting Jetpack-hosted videos. Will this plugin recognize bracketed VideoPress shortcodes Or should I use the literal URL/domain path and link to the specific file, maybe as the raw .mp4 file? Can the plugin see either one? @Terry, As of September 25, 2018, rel=0 only disables videos from other channels. This change was made by YouTube. Previous posters asked about disabling suggested videos from youtube, and you answered that adding rel=0 to the end of the URL would do that. It does not seem to work. @vijay, We only have support for this in our Lightbox Ultimate plugin. How can i play Wistia video with your Video Lightbox plugin? Can you please tell me your shortcode for this? @Jerry, The plugin will be able to play the videos as long as they are not set to “private”. This question has been asked before but your answer wasn’t clear. With a Vimeo Pro account where video’s are set to only open from my domain (to prevent stealing, sharing and playing at other sites, etc), will Lightbox Ultimate open these videos? I intend to host my videos on dropbox. Is it possible to show videos using lightbox ultimate? @AJ, We do have an inline HTML popup option. It should be able to pop up any custom content in lightbox. What you can do is embed your optin code in an HTML div and then use that div ID in the link to open in lightbox. Please check our documentation for details. Is it possible to put an optin form in the light box? I haven’t tried it yet, just wondering about the options. Love the fact that you take the time to respond to comments. Thanks in advance! @Rz, Yes, you can navigate through an image gallery when it’s open in lightbox. Please check our demo page to see it in action. Hi, Is the plugin swipe gesture friendly on mobile and can be keyboard navigated on desktop for the image gallery? @Vito, If you have multiple videos/images on the same page it should appear automatically. I installed your Lightbox Ultimate wordpress plugin and was wondering if previous and next and x of y are supported on the lightbox popups? I couldn’t find anything on the documentation about it. @Terence, Yes, It’s possible. 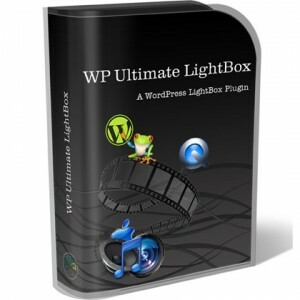 You can find links to the demo pages in the “WP Lightbox Ultimate Plugin Demo” section. Is it possible to add a video gallery using self-hosted videos? @Ray, Unfortunately It’s not possible at the moment. Hello! I have a page upon which I want to add a lightbox which will display another page with a short youtube video, a timed redirect and a skip video option. I have both pages created in wordpress, but the page I want to display in the lightbox has to be triggered from a relative URL that’s defined in the parent pages template module. Is this possible to do with your plugin? If so can I see, or get direction from a proof of concept? @Peter, Unfortunately It’s not possible at the moment. Hi, Is it possible to hover (mouseover) on an image to display YouTube video in a lightbox in PC? (And in mobile devices, YouTube video should be played when touched.) Thanks for your prompt response. Yes, they are approved to show on our site. I guess I need to change that huh. I should have thought of that. @Tatyanna, Is your vimeo video set to private? @Mark, You can disable suggested videos at the end by adding rel=0 to the URL. Hi there, Just bought WP LightBox Ultimate. Going well, but I would like to remove the suggested videos at the end of my youtube video when it has finished playing? Any ideas? 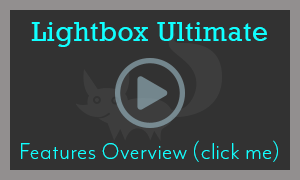 @Cristian, Our plugin does support self-hosted or externally hosted (publicly accessible) MP4 video popup in lightbox. However, It doesn’t automatically generate the thumbnail image. It needs to be manually created by the user. Hi, Can I use WP LightBox Ulitmate with self hosted videos? Does WP LightBox Ulitmate takes screenshots from the videos and uses them as video thumbnails? I have about 40 self hosted videos and would be great if I don’t need to make manual screenshots for each of them. @Isla, Unfortunately we don’t have any option to display Instagram, Twitter or Facebook items in lightbox. However, We have shortcodes that can popup media in a responsive lightbox window. You can see it in action on our demo page. 1. Is it possible to display dynamic Instagram, Twitter or Facebook items in the lightbox? 2. Is the lightbox responsive in all mobile environments? Can you remove youtube controls and title? The standard code for that in video lightbox doesn’t seem to be working. @Anangke, Is this question for our free video lightbox plugin or the premium one (lightbox ultimate)? If it’s video lightbox you can add a rel=”wp-video-lightbox” to your link and it will open the media in lightbox. If it’s the premium one you need to add rel=”wp_lightbox_prettyPhoto”. @Sareer, Our plugin can play MP4 videos in lightbox as well. Please check the demo page for more information. How to insert wordpress uploaded video in the shortcode? Or is this plugin just for vimeo and youtube? @Kari, It’s possible. If you use our prettyPhoto shortcode you should be able to show a title and description in lightbox. @Fernando, Do you mean like a div that contains text? If so It’s possible. With our inline HTML popup option you can open any custom content in lightbox. Hi, Does the WordPress Lightbox Ultimate Plugin support text layers? I mean, can I use it to open layers that contains nothing but text? @Sergiu, That should automatically be determined by YouTube based on the internet connection. However, we do have an option to set the HD option in our Lightbox Ultimate plugin. Hello, I have a question about the WP Video Lightbox plugin,is there a way to make Lightbox play youtube video as 720 HD default?I don’t know how to set it ,thanks in advance. Hi – So far, I’m loving this plugin. I’m stuck, however, in that I’d love to style my image anchor for MP4 video with a hover effect. Everything is working perfectly, I just need step-by-step help defining the css class and placing it in my theme’s custom css for a hover effect. I am having a problem with the LightBox Ultimate plugin. I would post a topic to the forum, but I don’t see an option to post–I can only read. Anyways, I have upgraded to the latest WordPress (4.5.2) and the latest Lightbox Ultimate plugin (2.2.1) and my MP4 videos will no longer launch a popup and play. This same exact page worked in the past with previous versions. This is happening on all my web sites which use these versions. They all used to work, and now they don’t. I am seeing this on pretty much all browsers–right now, I see it on a Mac running Chrome. @Ron, This means you can only open a vimeo video that is publicly available (by going to the video page while not logged into your vimeo account). Can I just check whether this means that the plugin can’t be used with a Vimeo Pro account where the video’s are set to only open from a specified domain? Or was that previous question by someone wanting to open vimeo video’s that they don’t own? I need to be sure the plugin will work with Vimeo Pro content before I purchase. Hi, I am using the Lightbox Ultimate plugin on my site and also using the Yoast SEO Premium plugin. The SEO plugin is telling me that I am missing alt tags on some images on my pages. I checked with their support team and they indicate that when the Lightbox plugin calls for an image as an anchor for a video or picture gallery, it is doing so without an alt tag in the actual code. I am wondering if there is a part of the lightbox shortcode that would allow me to put an alt tag in for the anchor image of my YouTube video – if not I will simply ignore that error message.